If you are purchasing a new machine from us, or the manufacturer you have purchased the machine from is having us do your install, please look over the following instructions and ensure if you have completed the required items for install. Many manufacturers will have us refuse install if the site is not prepared. Please call if you have any questions or are unsure you have completed the requirements. Most manufacturers require filtration of your water source for your machine warranty to be valid. We have an excellent and cost effective solution for your water filtration or you can sometimes purchase it from the manufacturer. If you purchase it elsewhere please keep in mind you will need to supply replacement cartridges on a regular basis (6 months). If you purchase from us we can replace them on your tune up schedule, as we keep them in stock at all times. The filtration we sell connects directly to either 3/8" pipe thread or 3/8" poly line (compression). 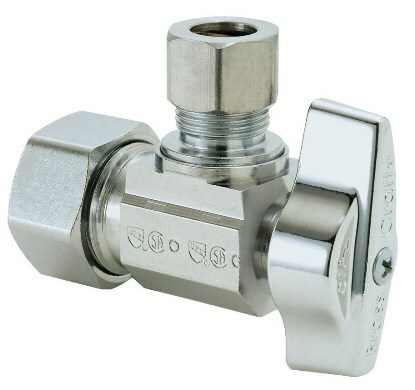 If other filtration is obtained, then the connection may differ, however we have adaptors for most sizes and styles of connection. If no filtration is installed the valve will remain the same and, depending on the machine, some adaptation may be needed. Some machines require only 20A, we prefer to stick with a 30A outlet and plug just to be on the safe side, but following the amperage requirement of the machine will be sufficient. Some machines (multiple boiler machines usually) may require even higher than 30A, even as much as 50A. Some stands or cafes were not wired for this and will need to have an electrician come in and install a new circuit or upgrade the one you have. Please consult us or the manufacturer for your machines amperage requirements before install. If your machine is 110v then the outlet will be one of 3 options, an L5-30 (looks just like the pic above), it will look like a standard household plug, or it will look like a standard household plug but with one prong turned sideways. Please obtain the matching plug to whichever outlet you put in as most machines do not come with a plug. You can check with the manufacturer during purchase to see if they supply a plug on the machine, but this is not common. It can be easily adapted over even if it does come with one to whatever outlet you have had installed. 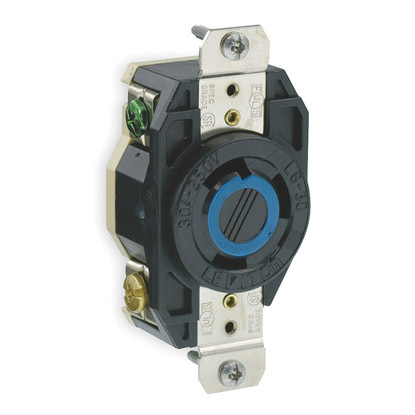 We do carry the plug that fits the L6-30 if you are unable to find one. Please keep in mind that, although they look the same, 30A and 20A plugs and oultets are NOT interchangeable. The diameter of the prongs is different. This is for safety and should never be ignored, forcing a 30A into a 20A may power the machine but we have seen them burn up because of this and it is not worth the risk! You will need a clear and level counter with enough space for the machine. We can supply you with dimensions of the machine you are purchasing, or you can obtain the manual from the manufacturers website and they are usually listed in the beginning or end. There will need to be a 2.5" hole in the countertop for the various supply lines and drain tube. This can be a bit of a trick as each machine is different, it will need to be under the machine and a ways away from the drain, but not too far, so that the drain can get some drop before going through the counter. The drain tube must have constant drop or it will back up and overflow the drain box. This can be done by us at the time of the install, which is often the best option because the machine can be placed where it will be and the holes drilled accordingly. Special care must be taken here to plan out the plumbing so it does not interfere with other items such as under counter fridges or cabinets. This can be just about any form of drain, most machines use a 5/8" ID or smaller drain tube, but some use a 3/4". The drain needs to be able to hold that size tube, and it should be directly under the machine, or fairly close, so the drain can have constant drop. If these conditions are not met prior to arrival for install, most companies will have us leave and reschedule install. This is an unneeded delay and can be inconvenient. Please follow directions closely unless you have spoken to a technician and there has been an exception. Do not trust the electricians and plumbers to install the correct thing, 9 out of 10 times at least 1 major thing is wrong on a new install. There will be a charge for procurement of items that are not supplied as per instructions above. We look forward to working with you on your install and training, getting a new machine is very exciting and it's even better if it all goes smoothly! !